There are no reviews for Eritis Sicut Deus yet. You can write one. 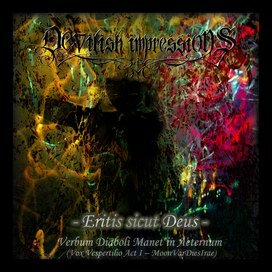 Full title: "Eritis sicut Deus - Verbum Diaboli Manet in Aeternum (Vox Vespertilio Act I – Moon Var Dies Irae)"
Re-released on "Adventvs" EP in 2014, with all tracks digitally remastered. Recorded at D.J. Wołkos 666 Studio, Opole, in September-October 2002.